IN HIS FIRST Cabinet reshuffle since taking office over two years ago, British Prime Minister David Cameron has announced a number of notable changes to the make-up of his front bench. They include the appointment of the culture secretary Jeremy Hunt to the Health Ministry despite recent calls for him to resign over his relationship to the media empire of Rupert Murdoch which led to one newspaper dubbing him the ‘Minister for Murdoch’. 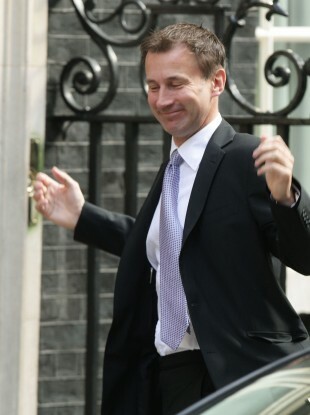 Hunt, who said he was “incredibly honoured”, replaces Andrew Lansley who held the health portfolio both in government and opposition as far back as 2003 and who had faced considerable criticism over his handling of reforms to the National Health Service. Cameron kept his cabinet heavy hitters including chancellor George Osborne, foreign minister William Hague, and home secretary Therese May in their posts. But he announced a change at Ministry of Justice where the veteran former Tory chancellor Ken Clarke has made way for welfare minister Chris Grayling. BBC News reports that the job was originally offered to the work and pensions secretary Iain Duncan Smith who turned it down. Justine Greening, the transport secretary, has moved to the Department for International Development and is replaced by Patrick McLoughlin who is seen as a Cameron loyalist and more in favour of the installation of a third runway at Heathrow airport which Greening was against. In his first reshuffle since the coalition government came to power two years ago, Cameron sought to rejuvenate the Conservative Party element in the cabinet with an eye on the next general election in 2015. Andrew Mitchell, a popular figure within the more right-leaning element of the Tory party, is now its chief whip. Theresa Villiers was promoted from a junior transport role to become minister for Northern Ireland, where two nights of rioting in Belfast has left more than 60 police injured. For the junior coalition party, the Liberal Democrats, the changes have been minimal with its five cabinet ministers staying in place. Former chief secretary to the treasury, David Laws, returns to government two years after he was forced out over a row about a housing agreement with his male partner. He takes up a role in the education ministry. The promotion of Hunt surprised political commentators. He had clung on to his job in April despite claims that his office leaked confidential information to Murdoch’s News Corporation over its bid to take full control of BSkyB. The reshuffle comes as Cameron faces into a crucial autumn and winter as his government seeks to overcome the considerable unpopularity its cuts have created with Britain dipping back into recession earlier this year. A YouGov poll in The Sunday Times newspaper put support for the Conservatives at 35 percent, Labour at 41 percent, and the junior coalition partner the Liberal Democrats at nine percent. Some 60 per cent of those polled thought Cameron was doing badly as prime minister, while 67 per cent thought the coalition was working together badly. Email “British cabinet reshuffle sees 'Minister for Murdoch' get health portfolio ”. Feedback on “British cabinet reshuffle sees 'Minister for Murdoch' get health portfolio ”.